integrate directly into your email newsletters. It’s no secret that a regularly scheduled nutrition newsletter from registered dietitians, nutritionists, and health coaches is a great way to market your business. Don’t sweat over creating content. No more staring at a blank screen when you’ve got to write a customized nutrition newsletter to your customers. Point and click on the content you want. Customers thrive on constant insights and resources. Choose from a variety of topics that represent your expertise. After you select your content, customize your nutrition newsletter with your own business news and events. Watch and discover how it works. I love that I have Customized Nutrition Newsletters to keep my business in front of my clients who often forward along to share with their friends, which gives me and my practice valuable exposure…a great marketing tool and service valued by my clients. 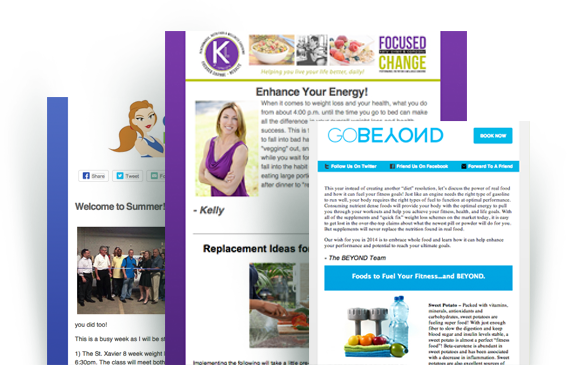 See how it works and what’s included in each customized nutrition newsletter.